Get the extra coverage depth you need with a deeper wall plate. 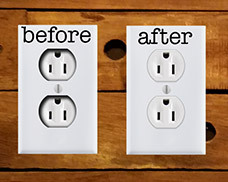 Buy raised outlet covers and switch plates to cover an electrical box that protrudes from the wall. These extra deep switch plates have a beveled edge that wraps around electrical boxes that aren't sitting flush with the wall. Find the solution for you - toggle, duplex outlet, rocker, blank and other hard to find configurations. Click to see deep plate solutions below. 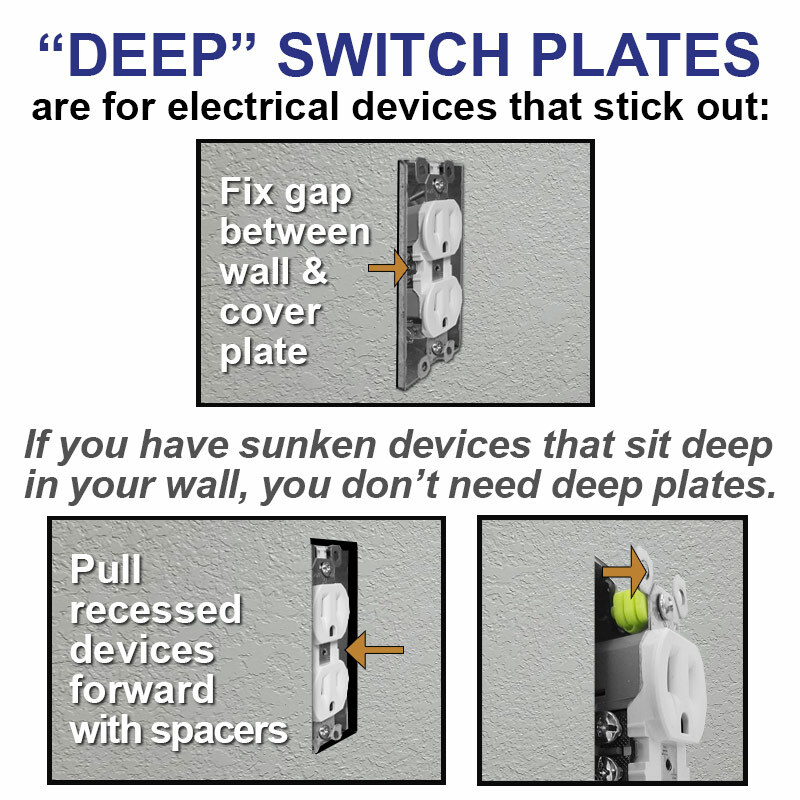 "Deep" plates are for electrical outlets and light switches that stick out of the wall. 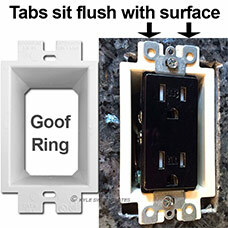 If you need a plate to cover deep outlets that sit back in the wall, use a standard cover after stacking spacers underneath the device to pull it forward or use a goof ring to support the device once pulled flush with the surface. 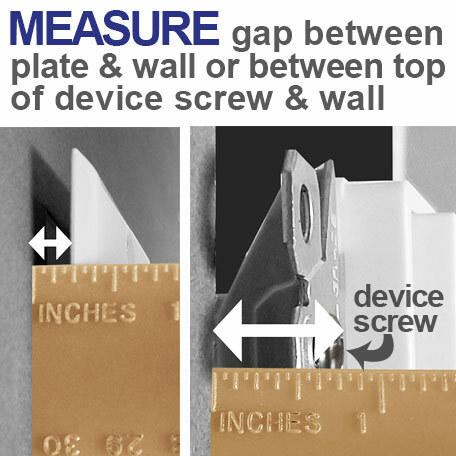 Where there's a gap between your cover and the wall, you will need to measure the size of the gap to determine which deep plate will fit your situation. Use a ruler placed flat against your current cover plate to see how large of a gap needs to be filled. Keep in mind plates made in different materials will have different thicknesses (ex: metal vs plastic ones). You can also measure the distance between a floating device and the wall's surface. The distance you want to measure is from the wall to the top side of the device (the highest spot the cover plate will rest on). Look for the screws holding the device in the electrical box & measure from the wall to the top of that screw. It's important to get a precise and accurate measurement, to ensure you order the correct solution. If your ruler has extra space on the end or your tape measure is worn out, try using cardboard or a piece of paper to mark the size of the gap, then measure the paper on a flat surface. You can measure in mm if that helps. For situations with a distance of 5/16", our deep metal plates are the perfect fit. For greater distances, see your options below. Note that you can add spacers behind your device to lift it up even more if a plate is slightly deeper than you need. Otherwise, you may have sunken devices in a plate that's too deep. When your electrical box protrudes from the wall instead of sitting flush, you can easily correct the problem with a deep switch plate. 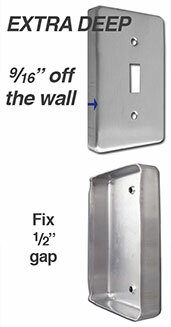 Kyle Switch Plates carries a variety of solutions for electrical boxes that don't sit flush with your wall. 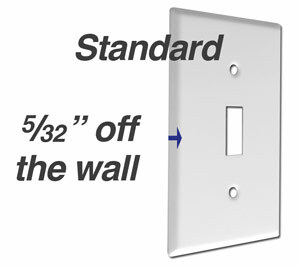 Standard light switch and outlet cover plates have a 5/32". If your standard plate doesn't sit flush with your wall, find several solutions to fix gaps between your wall and cover plate below. When an electrical box sticks out a little bit, you can use a deep switch plate to correct the problem. Deep faceplates give added depth and sit 5/16" off the wall. 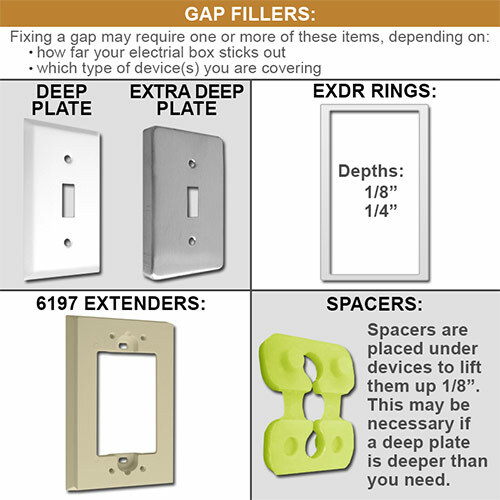 For situations in which you need even more coverage, our extra deep line of wall plates and outlet covers sit 9/16" off the wall. These plates are only available in stainless steel and feature a different edge from the typical beveled edge you find on standard and deep cover plates. Note that extra deep plates have rounded edges and are not meant to be stacked with EXDR depth rings (the corners will not align). These depth rings do not extend beyond the size of your cover plate, making them less visible. Sits just underneath your cover to fill a gap of 1/8" caused by a protruding wall box or a protruding device. Extra deep rings will fill 1/4" gaps. They come in a variety of sizes to fix a 1/4 or 1/8" gap behind a switch plate. Works for sizes from 1-gang up to a 5-gang cover. For standard and oversized solutions. 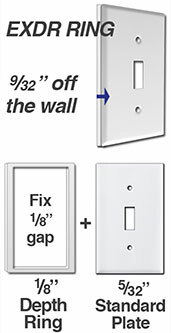 To really raise your light switch or outlet covers of the wall, you can use switch plate extenders behind the plates. 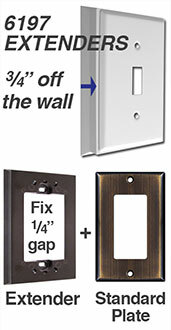 These will raise any single gang wall plate 3/4" off the wall. The most common situation that calls for electrical box extenders is when you have a shallow box that causes devices - such as GFCI outlets or light timers - to stick out of the box. Extenders will expand electrical boxes 3/4" to make room for bulky devices. 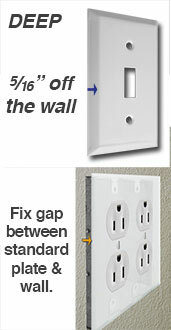 Get a shallow box extender here to place behind a standard switch plate. This is a standard toggle plate with a depth ring placed behind it. This will help cover a handy box that protrudes from your wall's surface 1/8". 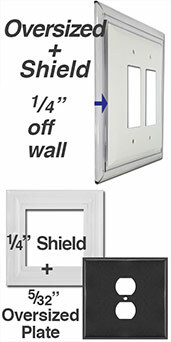 Rings are 1/8" deep and raise any single gang wall plate 1/8" off the wall. Add a quarter inch of depth underneath a 2-gang oversized cover plate with a clear plastic switch plate depth shield. Note that the clear depth shields only work with 2-gang oversized covers (for 2 devices or for centered single devices). 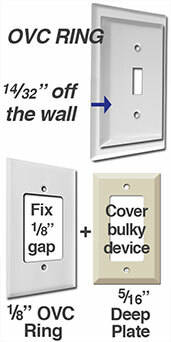 Need a deeper light switch cover in a configuration you don't see? Use wall plate inserts and fillers to convert Decora Rocker style openings to accommodate phone jacks, cable jacks, toggle switches and more. Create a deep switch plate in any configuration. Here's an example of a triple rocker cover plate with a single rocker switch (far right) and 2 inserts which convert to a cable jack and a toggle light switch. 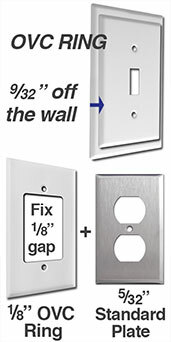 Shop all inserts to convert your wall plate. If your electrical box sits too deep in your wall - for instance after you add shiplap - you can bring the devices out with either spacers of a goof ring. If you add granite, tile or paneling to your wall surface, you will end up with a sunken electrical box that sits too deep. This will leave a gap between your devide and your cover plate. Use goof rings and long screws to pull devices out to your final surface level. For walls with new panelling, tile or granite, you will need to raise your electrical devices up to meet your new surface. Spacers are an excellent way to do this. 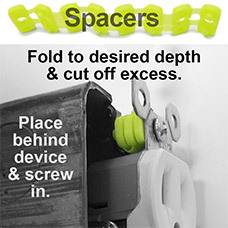 Stack as many 1/8" spacers as needed to get devices flush with your tile or wainscoting.